For decades the power at the authority centered not on the executive director, but on the board chairman, a post held at times by civic lions like Richard Ravitch or politically connected businessmen like Peter S. Kalikow. But a 2005 law made the chairman’s job, which has a fixed six-year term, more advisory and shifted control over policy and day-to-day decisions to the executive director. 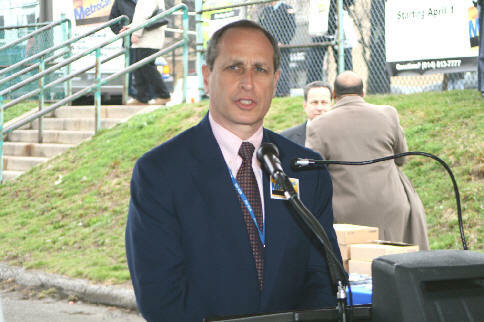 When Mr. Sander took over the authority in January 2007, he became the first executive director to take full advantage of the expanded powers. But Mr. Sander’s position is also something of an unwieldy hybrid: he has much of the power once held by the chairman but not the broad sway and job security that comes with a fixed term and a vote on the board. Though Mr. Sander is an employee of the board, he serves at the behest of the governor and can be removed at any time. And the governor he serves today is not the one who appointed him: his friend, Gov. Eliot Spitzer, who resigned earlier this year in disgrace. Though Mr. Sander says he has a strong relationship with Mr. Spitzer’s replacement, Gov. David A. Paterson, the two are clearly not as close. Personally I am a big fan of Elliot Sander. While he has come under criticism with some being rightfully so such as when he took a pay raise while the agency was crying poverty. Even with that though, he has shown himself to be a strong leader while trying to work around the agency’s financial difficulties while maintaining current service levels. I admit that he has a long way to go in terms of helping the MTA navigate its way out of the financial crisis but he clearly is the right man for the job. Lets just hope “Lee” can get it done like many of us believe he can.